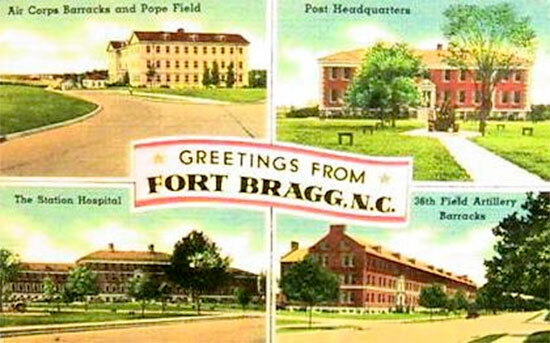 Vintage souvenir postcard of Fort Bragg, Fayetteville, North Carolina. This was the Post where the 27th Station Hospital was officially activated on 5 May 1942 as part of the “Provisional Hospital Training Center”. One (1) Officer and twenty-five (25) Enlisted Men, selected as an initial cadre from personnel at the Station Hospital, Fort Jackson, South Carolina, formed the nucleus of the 27th Station Hospital officially activated, effective 5 May 1942, at Fort Bragg, Fayetteville, North Carolina (Field Artillery Replacement Training Center; acreage 129,411; troop capacity 4,311 Officers and 76,175 Enlisted Men –ed), as per General Order No. 41, Headquarters, Second United States Army, Memphis, Tennessee, dated 14 May 1942, and designated a 250-bed hospital. Partial view of the installations at Fort Jackson, Columbia, South Carolina, taken during the interbellum years. Leaving Ft. Jackson, S.C., at 1700 hours, 4 May 1942, the cadre moved to Ft. Bragg, N.C., by rail, where they arrived at 2300 hours and were immediately assigned barracks in the Animal Area of the Fort. At Fort Bragg, 5 May 1942, Lieutenant Colonel Isaac J. Frisch, MC, O-242778, assumed command. Completing the original number of five (5) Officers who were with the organization from its inception were: Captain William Hope, MAC, O-179293, 1st Lieutenant Thomas G. Fowler, DC, O-336958, and 2d Lieutenant Raymond B. Long, MAC, O-454073. A series of changes of command followed soon. Originally attached to Second US Army upon organization, the unit on 6 May 1942, was attached to I Army Corps, Columbia, South Carolina, for duty and administration. Additional changes were as follows: 16 May 1942, released from control of I Army Corps, effective midnight, 19-20 May 1942; 19 May 1942 attached to Fourth Corps Area, Atlanta, Georgia, for administration and training; and 29 May 1942, attached to The Surgeon’s Office, Fort Bragg, North Carolina, for administration and training. At Ft. Bragg, N.C., the 27th Station Hospital was one of seven (7) Training Hospitals constituting the Provisional Hospital Training Center and organized under a Provisional Headquarters. For approximately one month, the 27th, as did the others, remained in its original nuclear form, during which period adjustments were made, the cadre received appropriate instructions, and preparations were made incidental to the anticipated arrival of new personnel. During the Fort Bragg period of development, 1st Lieutenant Maynard I. Shapiro was the Executive Officer and on two occasions assumed command of the organization in the absence of Lieutenant Colonel I. J. Frisch, from 29 May to 10 June 1942, and from 19 July to 28 July 1942. Growth for the 27th Station Hospital began on 1 June 1942, with arrival of eight (8) EM from Service School, Fort Sam Houston, Texas. These men were systematically interviewed by Lieutenant Shapiro, their records examined, and all information recorded in readily accessible form for future reference. This process had already been carried out in regard to the initial cadre and was to be repeated for each contingent. Picture illustrating a typical improvised bivouac set up during field training. Members of a KP detail at work during one of the first stages of food processing and preparation. A course of instruction according to prescribed training schedules was begun for these men and those to follow them under the supervision of Officers and Noncommissioned Officers. Thereafter, new men came in comparatively fast and from various sources. Twelve (12) new personnel were received from the Medical Replacement Training Center (Camp Lee, Petersburg, Virginia) on 10 June; one (1) man from William Beaumont General Hospital (El Paso, Texas) on 11 June; one (1) man from Camp Lee, (Petersburg, Virginia), on 13 June; forty-five (45) from Camp Lee, (Petersburg, Virginia), on 15 June; one (1) from the Army Medical Center, (Washington, D.C.), on 29 June; two (2) from William Beaumont General Hospital (El Paso, Texas), on 1 July. One (1) man was lost to the 37th Engineer Combat Battalion (Camp Edwards, Falmouth, Massachusetts) on 2 July. More people arrived from Fort Monroe, (Suffolk, Virginia),; as well as sixteen (16) men from the Medical Replacement Training Center, Camp Pickett, (Blackstone, Virginia), on 15 July. Finally, one (1) man was lost through disability discharge. Officer personnel which had previously remained at five (5) was now rapidly brought up to allotted strength through the following additions: 1 Officer (18 July); 2 Officers (19 July); 13 Officers (20 July); and 1 Officer (14 August). On 25 July 1942, the 27th Station moved from the Animal Area, Ft. Bragg, N.C., to the Motorized Area, Ft. Bragg, N.C., known as “Smoke Bomb Hill”, a distance of approximately three miles. During the remainder of this period the facilities of the Post Station Hospital continued to be used for the training of both Officers and Enlisted Men in their respective fields. Between 15 and 23 August 1942, additions to Enlisted personnel continued with the arrival of 29 men from the Medical Replacement Training Center, Camp Grant, Rockford, Illinois (Medical Replacement Unit Training Center; acreage 3,349; troop capacity 453 Officers and 20,836 Enlisted Men –ed, followed by 3 more men; and also 1 man from Fort Bragg, Fayetteville, North Carolina. On 18 August 1942, Major Paul D. Clark assumed command, Lieutenant Colonel I. J. Frisch being absent sick in Stark General Hospital, Charleston, South Carolina. On 26 August 1942, the organization undertook its first overnight bivouac as a unit, leaving about 0700 and marching with full field pack and equipment to the bivouac area, about 7½ miles distant. The men seemed to adapt well to life under field conditions. The formative period of the organization at Ft. Bragg, N.C., was brought to a close by a Letter dated 31 August 1942, Headquarters, Fort Bragg, Fayetteville, North Carolina, ordering the unit to Fort Ord, Monterey, California (Landing Vehicle Board & Army Ground Forces Training Area; acreage 28,690; total troop capacity 51,253 Officers and Enlisted Men –ed), for “temporary change of station, preparatory for transfer overseas”. Prior knowledge of the impending move had been received verbally, and preparations made accordingly. All EM received a physical examination to determine their fitness for overseas field duty. Nine (9) were found unqualified and were subsequently dropped from the organization on 31 August. Prior to departure, all Enlisted Men were required to stand a showdown inspection of all clothing and equipment, and following this the organization was brought into a state of complete readiness for departure. At 2315 hours 31 August 1942, the 27th Station Hospital entrained for Fort Ord, Monterey, California. The trip went smooth and without exceptional incident. Upon arrival at Fort Ord, the organization detrained, and after necessary arrangements had been completed, the final leg of the journey was made by motor convoy to Salinas, California. At 1800 the trucks reached their destination, the Salinas Garrison, where the men were quartered in buildings formerly occupied by Japanese aliens and subsequently by Filipino troops. Map illustrating the military installations and allied camps and industries established in the State of North Carolina during World War Two. The days at Salinas, Fort Ord, California, represented a period of transition from a training to a functional status, an interim of assembly and preparation before the decisive move overseas. During this period the organization was attached to VII Corps. Final preparations for departure were concluded, including one last inspection, a final dental check, and completion of the required immunization. It should be underlined that at this point the 27th still lacked its full personnel complement. All the Officers were present, with the exception of a Chaplain, but there also remained a few EM to be added, and more particularly, the 30 Nurses had yet to arrive. The Chaplain was assigned and joined 26 September; the Principal Chief Nurse arrived the same day; and on 28-29 September 1942, 29 ANC Officers were received. The missing Enlisted personnel came gradually through with 12 EM from Fort Douglas, (Salt Lake City, Utah); 5 from Letterman General Hospital, (San Francisco, California); 13 from Camp Roberts, (San Miguel, California); and 1 from the Replacement Depot, Fort Ord, (Monterey, California). The last men joined 3 October 1942. A significant change occurred on 2 October 1942, when Colonel Clifford W. Whitaker, MC, O-222761 assumed command, as per Radiogram, Headquarters, Ninth Service Command, Fort Douglas, Utah, dated 27 September 1942. On 6 October 1942, the 27th Station with 21 Officers, 30 Nurses, and 150 Enlisted Men (the full complement as authorized by T/O 8-560, dated 22 July 1942 –ed), was transferred to Camp Stoneman, Pittsburg, California (Staging Area for San Francisco Port of Embarkation; acreage 3,252: troop capacity 2,604 Officers and 35,607 Enlisted Men –ed) from Ft. Ord, Monterey, California, per Letter, File 370 c, Headquarters, VII Corps, San José, California, dated 2 October 1942. After traveling a distance of 140 miles by rail, the unit arrived at the camp site around 1600 hours. The period at Cp. Stoneman was devoted principally to more training and preparatory activity. From now on the Nurses started participating in various formations such as gatherings for medical and surgical lectures, road marches, gas mask drills, etc. First aid teams were formed, consisting of small amicable groups, who reviewed first-aid procedures through demonstration, exercise, and practice. The “Rochambeau” was part of a 7-ship convoy traveling to the South Pacific Area. The same convoy carried personnel pertaining to 5 different Army Hospitals, including the 27th and the 48th Station Hospitals. Partial aerial view of Fort Ord, Monterey, California, taken in 1941. On 10 November 1942, the 27th Station Hospital, comprised of its full complement (as authorized by T/O 8-560) debarked from the USS “Rochambeau”, AP-63 (converted French liner built in 1931, seized in the Philippines by USN and French sailors, proceeded to Balikpapan, and to Australia, New Zealand, and the US. Taken over by the US Maritime Commission 20 April 1942, and transferred to the US Navy 27 April 1942, for use as a troopship –ed), and landed at Nouméa, New Caledonia. The group was moved by truck to the bivouac area of the 9th Station Hospital (activated 11 February 1941, embarked for Australia 23 January 1942, arrived in New Caledonia 11 March 1942 –ed) near Dumbéa and made camp. The organization was temporarily attached to the 9th Station for rations and preparations for picking a new and permanent bivouac site began at once by the Commanding Officer. New Caledonia would emerge as the new center of medical activity following the transfer of the SPA Command to the island. Almost 250 miles in length the island was roughly halfway between New Zealand and the Solomons. A colony of France, it comprised some 8,500 square miles of varied countryside. By late 1942, its population included 55,000 civilians under a Free French colonial government in the capital city of Nouméa. From the military point of view the island held a Battalion of French and colonial troops, the Americal Division, a large US Navy base, a few Australian troops, and the Island Service Command (more American Hospitals were set up in New Caledonia than anywhere else in the South Pacific –ed). The site was selected and a detail of Enlisted Men under the direction of 1st Lieutenant Raymond B. Long was sent to the docks to obtain the unit’s supplies and transport them to the chosen site. On 19 November 1942, a detail of 50 EM moved to the bivouac site to clear the area and to guard and sort the supplies. The men were quartered in pup tents for a few days until the area was cleared for their permanent quarters. The CO immediately began securing building and construction supplies necessary for actual construction of semi-permanent installations. On 5 December 1942, the “Panettiere Hospital”, formerly operated by the forward echelon of the 52d Evacuation Hospital (activated 12 January 1942, embarked for New Caledonia 23 January 1942 – ed) and located in the heart of Nouméa, was taken over by a small group of Officers, Nurses, and Enlisted Men of the unit. This plant was able to care for 100 patients. About the same time, 30 Enlisted Men were placed on DS with the 130th Quartermaster Regiment to help them transport supplies and equipment to the various installations on the island. Cement, aggregate, form lumber, plumbing supplies and other materials were arriving daily allowing the men to clear the area, stack supplies, construct latrines, mess halls, and kitchens for the comfort of the Officers and Enlisted personnel located at the site. Soon ward tents were pitched over the concrete floors and around 23 December the Anse Vata section of the 27th Station Hospital began to take shape. In the evening a Christmas party was given for the men which served to loosen nerves drawn taut from the hard labor. On 24 December 1942, the Commanding Officer was given notice to be prepared to receive 200 evacuee patients from various hospitals at the bases who were due to arrive around 5 January 1943. The patients indeed came in, and on 21 January 1943, 246 additional patients were admitted directly from the combat zone. One hundred-eighty-six (186) of these were severely wounded surgical cases which were cared for at the “Pannettiere” section of the Hospital. Four (4) more Officers joined the unit: Captain F. S. Dietrich, MC and Captain Joseph Urkov, MC on 7 January; followed by Major Thomas Burrus, MC and Major Ray A. Clark, MC on 9 January 1943. The works progressed well, and soon a 30-hole screened-in latrine was dug and constructed. Meanwhile all the men on DS had been recalled to help the overworked wardmen of the unit; they all got back on duty at the end of January. A shower room was erected with a 2300-gallon water tank; followed by receipt of a 15 KW generator. 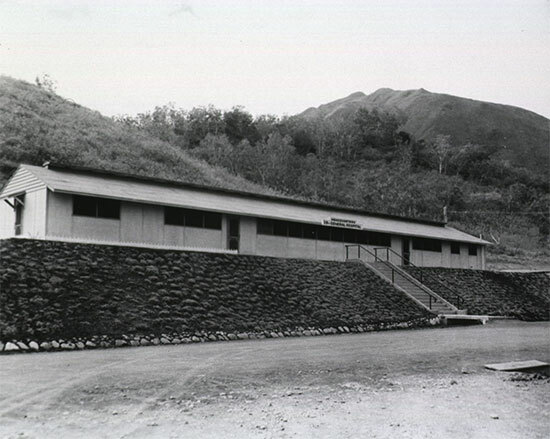 With the help of the 131st Engineer Combat Regiment (since 9 November 1942 in New Caledonia –ed), surgery sections were completed, allowing the Surgical Service to open by 11 February 1943. USS Rochambeau, AP-63 (Attack Personnel) which brought the 27th Station Hospital to Nouméa, New Caledonia, where the unit landed on 10 November 1942. On 12 March 1943, the Hospital received the much needed help of the 26th Medical Hospital Ship Platoon, consisting of 3 Officers and 26 Enlisted Men, who were placed on DS with the 27th. Lt. Colonel Wallace I. Douglas, formerly, Surgeon, USAFINZ, a newly arrived Surgeon who moved from New Zealand to New Caledonia in March 1943, now with Service Command, inspected both sections of the Hospital on 19 March. During February 1943, the patient census varied between 366 and 436, while the latter part of the month saw the beginning of the Dengue fever epidemic. The Hospital patient census began to increase dramatically with the great load due to the Dengue fever outbreak, which seemed to be centralized in the Nouméa sector. All personnel worked long hours to cope with the epidemic and were therefore supplemented by 1 Chief Nurse and 16 Nurses temporarily assigned to the 27th. Unfortunately the 26th Medical Hospital Ship Platoon were ordered to duty elsewhere and were therefore withdrawn on 19 April 1943. Luckily the workload was lightened to some extent when 5 Officers and 50 EM from the 52d Evacuation Hospital were placed on special duty with the organization. The Dengue fever epidemic continued with an average patient census reaching 600 daily. It was not until the latter part of April when, due to cooler weather and fewer mosquitoes, the incidence of Dengue fever began to decrease. As a result of the decrease of the epidemic, the Officers and Enlisted Men of the 52d Evac left the area 11 May. Two days later, 42 male Nurses, on their way to join their assigned organization, arrived to relieve the shortage of manpower at the 27th Station while awaiting for a transshipment. On 28-29 May 1943, the 27th Station Hospital underwent a thorough inspection by the Inspector General’s Department of the Service Command and USAFISPA and was given a general rating of ‘excellent’. The 42 assigned Nurses were relieved from duty at the station on 29 May. In the meantime two additional huts were completed for the Nurses; one for recreation and entertaining guests and the other for quarters of visiting ANC personnel. Between 2-3 June 1943, 29 Enlisted Men of the 109th Station Hospital (activated 1 June 1941, embarked for New Caledonia 23 January 1942 –ed) were attached for duty to relieve ward men who were tired from overwork with dengue patients. On 4 June 1943, Brigadier General Charles C. Hillman, MC, of the Office of The Surgeon General in company of Lieutenant Colonel Earl Maxwell, MC, Surgeon, USAFISPA (United States Army Forces In the South Pacific Area), and Colonel Wallace I. Douglas, MC, Surgeon, Service Command, APO 502, inspected both sections of the Hospital. On 11 June, the 553d Medical Hospital Ship Platoon, consisting of 3 Officers, 5 Nurses, and 22 Enlisted Men, were attached to the unit in order to help care for the patients. From 18 to 30 June 1943 saw the completion of various structures and improvements in the hospital area. On 1 July 1943 3 Officers and 16 ANC Officers were transferred from the organization to become a portion of the professional staff of the “Panettiere Hospital” which was to be activated as the new 336th Station Hospital, a 100-bed organization, with Captain Sylvester W. Rennie, MC, commanding. Furthermore, 2d Lieutenant Lyle H. Stryker, MAC, and 34 EM were put on SD with the new Hospital until permanent personnel could be furnished from other sources. Mid-July, functioning with an average census of 500 patients, 1 Officer, 2 Nurses, and 4 Enlisted Men of the 565th Medical Hospital Ship Platoon (Separate) were attached for special duty. On 19 July 1943, the 558th Medical Hospital Ship Platoon (Separate) arrived for special duty with the 27th. They were followed soon by 26 EM from the 109th Station Hospital. 27 July, 3 Officers, 5 Nurses, and 45 Enlisted Men from the 8th General Hospital were further attached to the organization. Captain Maynard I. Shapiro, MC, formerly a member of the command, was assigned and put on special duty with the Surgeon, Service Command, as the Evacuation Officer. A 2d Lieutenant Mildred J. Tobiason, ANC was promoted to 1st Lieutenant on 25 July 1943, to fill the vacancy opened by the change in ANC personnel T/O. From L to R: Tontouta Airfield, Nouméa, New Caledonia, August 1943; aerial view of the central part of Nouméa and harbor, New Caledonia, March 1943; aerial view of the 27th Station Hospital, Nouméa, New Caledonia, February 1943. P.S. 2 Officers, 1 Nurse, and 31 Enlisted Men pertaining to the 27th Station Hospital were on special duty with other organizations. Additional personnel was to be requisitioned as per normal procedure. Special attention was expected to requisitioning of any Specialists required. This also applied to requisitioning of additional supplies and equipment. Many battle casualties were continuously clearing through the Hospital. On 19 August, some 209 patients were evacuated to the continental United States, but on 23 August, 177 patients were received from New Georgia, of whom 58 were litter cases. The First Lady (Mrs. Eleanor Roosevelt), accompanied by Major General Rush B. Lincoln and Miss Coletta Ryan, ARC, visited the 27th Station Hospital on 26 August speaking with many patients, reassuring and comforting them, which certainly increased the morale of all. She was on a 5-week tour of the SPA visiting medical units and others. By authority of the President of the United States and Letter, Headquarters, Island Command, a General Order was published awarding 72 Purple Heart Medals to evacuees of the battle area. All medals were presented by the Commanding Officer, Lieutenant Colonel Clifford W. Whitaker, MC, on 28 August 1943. P.S. 2 Officers, 1 Nurse, and 7 Enlisted Men pertaining to the 27th Station Hospital were on Special Duty with other organizations. The maximum load of patients was reached on 5 September 1943, when the patient census was 802, almost 3 and 1/5 times the capacity for which the Hospital was organized. On 8 September, 330 patients were evacuated to the Zone Interior, also an all time high for evacuation. Headquarters building of the 29th General Hospital, in which the telephone office was located at the far end. The telephone central office pole shows above the roof. The organization after being reorganized under a 500-bed Table of Organization, effective 20 September 1943, began to see the results of it all when 26 EM were assigned from the 6th Replacement Depot on 1 October. With the assignment of new personnel the workload dropped almost to normal when 383 patients were evacuated to the ZI for further treatment and disposition on 6 October 1943. On 9 October, Captain Jean A. Gruhler, MC, Assistant Chief of Surgical Service was evacuated to the United States for ill health. More Officers were assigned and joined from the 6th Replacement Depot on 19 October; they included Captain George Naselli, DC and 2d Lieutenant Jay R. Fickes, MAC. A new ANC Officer, 2d Lieutenant Katherine J. Daly was transferred from the 8th General Hospital. Unrelated to the arrival of new personnel, Officers of the command were still placed on SD with other medical units. 19 October 1943 marked the First Anniversary of the unit overseas; it was duly celebrated by a party for the Enlisted personnel on the evening of 20 October. For this special occasion, the Officers and Nurses replaced the EM on duty in order that all could attend. P.S. Captain Maynard I. Shapiro was on SD with the Port Surgeon, Service Command, APO 502. Captain Harold C. Shulman was on DS with the 37th Infantry Division, APO 37. Captain William Godfried was on SD with the 336th Station Hospital, APO 502. One (1) Enlisted Man was on duty with the Port Surgeon, Service Command, APO 502. During the first half of November 1943, work continued in a routine manner, while more Enlisted Men continued to join increasing the Enlisted strength. Chaplain John Rikkers, ChC was promoted to Captain as per Special Order No. 310, Headquarters, USAFISPA, APO 502. Plans to convert the hospital structures from canvas tentage to wooden buildings were approved and material began to arrive. On 24 November the Engineers started construction. It was agreed that a skeleton crew would operate the Hospital on Thanksgiving Day so that all personnel and patients could enjoy a delicious turkey dinner with all the trimmings. P.S. Captain Maynard I. Shapiro was on SD with the Port Surgeon, Service Command, APO 502. Captain Harold C. Shulman was on DS with the 37th Infantry Division, APO 37. Captain William Godfried was on SD with the 336th Station Hospital, APO 502. Four (4) Enlisted Men were also on DS with several other organizations. At the Out-Patient Clinic of the 71st Station Hospital in Fiji, Capt. 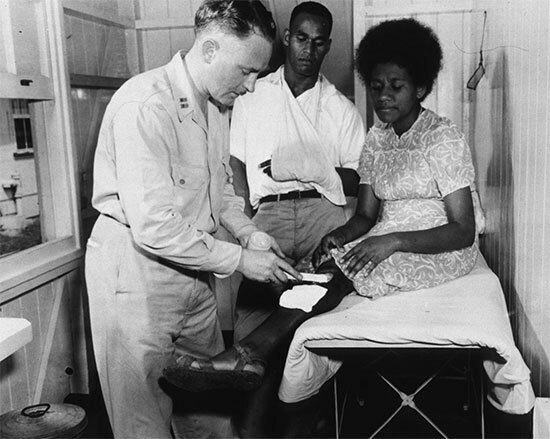 George Warnock, MC, of Freeport, LI, treats a Fijian woman, Stery Uquaqe, for burns, as her husband, Roney, looks on. A new PX building was completed on 19 December and already opened for business the following day. 2d Lieutenant Rita V. St.André, ANC, was transferred to a General Hospital in the ZI for further treatment and disposition. She was the first Nurse to be returned to the United States or hospitalized for any length of time. Arrangements were made through the cooperation of the Commanding Officer, the Special Services Officer, the Chaplain, the American Red Cross, and various Officers and Enlisted Men of the organization for entertainment for both patients and personnel during the Christmas holidays. A movie program was given on Christmas Eve. Carols were sung by a mixed choir of Officers, Nurses, and Enlisted Men. As a climax to the program, Santa Claus made his appearance in an Army jeep and distributed presents to all patients present. On 24 December 1943, Christmas morning, about 0500 hours, the Officers distributed gifts to all the EM in their quarters. Everyone seemed to enjoy Christmas as much as it was possible to enjoy it, being far away from home. P.S. Captain Maynard I. Shapiro was still on SD with the Port Surgeon, Service Command, APO 502. Captain Harold C. Shulman was kept on DS with the 37th Infantry Division, APO 37. Captain William Godfried was also still on SD with the 336th Station Hospital, APO 502. Six (6) Enlisted Men were also on Detached Service with several other organizations. On New Year’s Day the Hospital operated with a skeleton crew of men who had been off duty on Christmas Day. Due to the expansion from a 250-bed Hospital to a 500-bed Hospital many vacancies in Commissioned grades existed. Consequently, the month of January 1944 saw many of these filled by promotion of assigned Officers and Nurses. Between 4 January and 20 January 1944, a large number of Medical / Surgical and ANC Officers were promoted, which no doubt raised morale appreciably among the Commissioned personnel. The 27th witnessed its first real tropical storm on 18 January 1944. Even though a storm warning procedure had been set in motion (but not yet published), all worked in an efficient and organized manner caring for patients and protecting Government property. Even though construction had begun during the previous months, a good part of the Hospital was still under canvas. Patients were therefore evacuated to the completed wooden wards, and those housing the Dental Clinic and PX where they were fed and made as comfortable as possible. The tentage covering the evacuated parts was struck to prevent its complete destruction. Picture of Brigadier General Earl Maxwell, Surgeon, United States Army Forces In The South Pacific Area (USAFISPA). P.S. Major Maynard I. Shapiro was now assigned on SD with the 8th General Hospital. Captain Harold C. Shulman was relieved from DS with the 37th Infantry Division, APO 37, and returned to duty 15 January 1945. Captain William Godfried was also relieved from SD with the 336th Station Hospital, APO 502, and returned for duty on 25 January. Eight (8) Enlisted Men were also on DS with other organizations. The first February 1944 saw the unit almost fully converted to wooden structures. Several Ward buildings and the EENT Clinic were completed and occupied. Several days later the new Physical Therapy Clinic and Laboratory were ready and occupied. A number of promotions came through early February, including the CO, Lieutenant Colonel Clifford W. Whitaker, MC, who became a full Colonel, as per Paragraph 18, Special Order No. 50, Headquarters, USAFISPA, APO 502, dated 20 February 1944. The Hospital census averaged about 316 during February, this in fact being the lowest patient average since the unit began to function. The low census combined with the increase of personnel made it possible for those who had been working long hours carrying the major work load to have some time off. As result, 12 Enlisted Men per week were given 5-day passes to the EM Recreation Center at Camp Stevens, which proved a welcome break. P.S. Ten (10) Enlisted Men were also on DS with other organizations. March 1944 was an uneventful month, except that the new administration building was now completed, housing the Commanding Officer, Executive Officer, Detachment Commander, Chiefs of Services, Personnel Adjutant, Principal Chief Nurse, Chaplain, and the Sick & Wounded Department. A significant change in Commissioned personnel took place when Captain Ina J. Zarr, ANC, Principal Chief Nurse was relieved and assigned to the 122d Station Hospital on 2 March 1944. She was replaced by Captain Mildred J. Tobiason, ANC, Assistant Chief Nurse, recently promoted as per Paragraph 11, Special Order No. 73, Headquarters, USAFISPA, APO 502, dated 14 March 1944. The new rotation policy became effective in March and 3 EM were rotated to the United States under this plan on 14 March. P.S. Captain Raymond B. Long was on DS with the 17th Medical Supply Depot Company. Captain Herbert Weitzner was placed on TD with the 109th Station Hospital, APO 502. Twelve (12) Enlisted Men were also on Detached Service with other organizations. After nearly six months of construction by the 362d Engineer General Service Regiment (Colored) a new hospital installation was rapidly taking shape. The buildings were almost complete except for the Isolation Ward and some finishing work on buildings already occupied. All the wooden buildings were either New Zealand-prefabricated huts or permanent constructions with cement floors. The patient census was gradually decreasing with an average of 300 patients. The type of cases now hospitalized were almost typical civilian cases, such as respiratory infections, Dengue fever, and accidents. Illustration of island medical care, where US Army Hospitals also provided medical care and treatment to the local population. During April 1944, Captain Harold C. Shulman, MC, O-471191 was presented a miniature bronze battle star for participation in the Northern Solomons Campaign. Twenty-three (23) battle stars were awarded for Guadalcanal to Enlisted Men, and another 8 battle stars went to Enlisted Men who had participated in the Northern Solomons Campaign. P.S. Captain Raymond B. Long was still on DS with the 17th Medical Supply Depot Company, APO 502. Captain Herbert Weitzner was still serving on TD with the 109th Station Hospital, APO 502. Captain Harold C. Shulman was now on DS with Headquarters Company, Services of Supply, APO 502. Eight (8) Enlisted Men were on DS with other organizations. The patient census for May 1944 averaged about the same figure as in April. Dengue fever was not as prevalent as the previous year. A new Chapel was constructed and officially opened 17 May, with appropriate ceremonies. Seating capacity was 300 and the building included offices and store rooms for both the Protestant and Roman Catholic Chaplains. Thirty-four (34) American Red Cross girls were attached to the 27th for rations and quarters, awaiting assignment to organizations under control of USAFISPA or for shipment to other bases in the South Pacific Area. The presence of these women and a number of local French girls at an Enlisted Men’s dance on 28 May contributed much to making the dance a success. Music was provided by a band of the 362d Engineers. P.S. Captain Raymond B. Long was now on DS with Section 2, Advanced Depot Platoon, 67th Medical Supply Depot Company, APO 502. Captain Herbert Weitzner was still serving on TD with the 109th Station Hospital, APO 502. 1st Lieutenant Joseph L. Griffith, was on SD with The Surgeon’s Office, Island Service Command, APO 502. Seven (7) Enlisted Men were on Detached Service with other organizations. Events during June 1944 were very similar to the preceding months. Several changes in both Officer and Enlisted Men were in effect. The patient census continued to average around 275. With the completion of new wards, arrival of more equipment, and introduction of more conveniences for feeding, bathing, and caring, the work load greatly decreased. The Isolation Ward was finally completed, though not yet occupied. The parking area and the road system leading through the center of the Hospital were paved, and a new Officers’ Club completed. Four (4) more Officers joined from the 6th Replacement Depot and 2 Nurses were transferred to the 137th Station Hospital. Seven (7) EM were assigned and joined the Hospital. Visit of First Lady Eleanor Roosevelt. Mrs Roosevelt is flanked by Lieutenant General Millard Harmon, Commanding General Army Air Forces In The Pacific Ocean Areas (AAFPOA), at her right; and Admiral William F. Halsey , Jr., Commanding Officer Third US Fleet, at her left, during a stop over in New Caledonia, 14 September 1943. The First Lady visited the 27th Station Hospital on 26 August 1943. P.S. Captain Raymond B. Long was still on DS with Section 2, Advanced Depot Platoon, 67th Medical Supply Depot Company, APO 502. 1st Lieutenant Joseph L. Griffith, was on SD with The Surgeon’s Office, Island Service Command, APO 502. 2d Lieutenant Leone McCue was serving with the Medical Section, Headquarters, Service Command, APO 502, for duty at the US Army Dispensary. Nine (9) Enlisted Men were on DS with other organizations. In order to celebrate the “4th of July” as should be, the 27th Station Hospital held a big field day for patients and personnel. The Hospital was operated by a skeleton crew of Officers, Nurses, and Enlisted personnel so that all who desired might attend. Races, sports, and other recreational events were scheduled and announced over a PA system by Chaplain James R. Barnett. Between events, records were played and in the evening music was furnished by the 362d Engineers. To close this special day, a volleyball game was organized to decide the Hospital winners of an intra-mural tournament. This was followed by a delicious dinner of hamburgers, ice cream, and beer served by the Mess Department, making the day a complete success. Colonel C. W. Whitaker, MC, Commanding Officer, was given a Letter of Commendation for outstanding services to the war effort in this area by the CO, Service Command, APO 502. The professional services received many types of medical and surgical cases through the evacuation of casualties from the Saipan Campaign. The reception of these patients always raised the morale in all Departments due to the fact that the personnel felt and realized that they were definitely aiding and supporting the war effort! The average patient census for July 1944 was around 314, and no unusual cases were received in this period. P.S. Captain Herbert Weitzner now on SD with the US Army Dispensary. 2d Lieutenant Robert E. Dupree was on TD with the Theater Chemical Warfare School, APO 708. 1st Lieutenant Anne Collins was on SD with the US Army Dispensary. Eight (8) Enlisted Men were on Detached Service with other organizations. On 6 August 1944, Lieutenant Colonel Paul D. Clark, MC, Chief of Medical Service, assumed command of the organization in the absence of Colonel Clifford W. Whitaker, MC, who was placed on Special Duty to visit medical installations at APO 708 (Espiritu Santo, New Hebrides –ed) and APO 709 (Guadalcanal, Solomon Islands –ed). Six (6) ANC Officers left 8 August 1944 for fourteen days of rest leave in New Zealand. 2d Lieutenant Robert E. Dupree, MAC, returned from the Theater Chemical Warfare School, APO 708, after successfully completing the course of instruction. A training course for the entire personnel with 4 one-half hour classes each week covering all phases of Chemical Warfare was begun under his initiative. They proved both interesting and instructive. All EM on training with the organization (sent by the 6th Replacement Depot) were released on 14 August. They all passed as either Dental, Medical, or Surgical Technicians. Nine (9) more Enlisted Men were chosen to go on rotation to the ZI on respectively 9 and 18 August 1944. Thirty-seven (37) ANC Officers were temporarily attached for rations and quarters while awaiting transportation to another hospital; they left 6 September for the 18th General Hospital. Major Tyler J. Stroup, MC, Admission & Disposition Officer was released from the unit and placed on duty with Headquarters, New Caledonia Island Command for duty with the Surgeon. Unidentified members of the 27th Station Hospital in front of one of the prefabricated hutments in New Caledonia. Purple Heart Medals were presented to the battle casualties received during the latter part of July 1944 and to 2 additional casualties received in the course of August. Bedside presentation was made by Colonel Clifford W. Whitaker, with Nurses and relevant personnel assigned to the wards and other patients on the wards present. P.S. Major Tyler J. Stroup was on DS with Headquarters, New Caledonia Island Command. Captain Herbert Weitzner was now on SD with the US Army Dispensary, serving together with 1st Lieutenant Anne Collins. Five (5) Enlisted Men were on DS with other organizations. On 1 September 1944, an organized swimming course was started. It was to remain in effect until all personnel of the organization could swim 50 yards in bathing trunks and without the aid of a life preserver. A survey determined that only 80 men indicated they could swim, and 46 said they were unable to swim. By 1 October, 209 men qualified the actual test. Classes were held 3 days a week by competent instructors to teach those who were unable to swim the required distance. The annual inspection of the unit took place on 7-8 September 1944, with only a few minor irregularities and deficiencies being reported. The Officers’ Club under construction since May was finally opened 9 September 1944, followed with a dance for the Officers and their guests. A week later, the Enlisted Men were allowed a dance at the Club with music provided by the band of the 362d Engineer General Service Regiment (Colored) (in New Caledonia since 29 January 1943 –ed). A 25-bed Provisional Station Hospital, later absorbed by the 331st Station Hospital, was organized at the base with 3 Officers and 10 Enlisted Men of the 27th Station Hospital, being placed on Detached Service as part of the personnel. P.S. Captain John D. Shinberg, 1st Lieutenant Adam Kreps, and 1st Lieutenant Jay R. Fickes, are on DS with the 331st Station Hospital. Ten (10) Enlisted Men were on DS with the 331st Station Hospital. Activities for the month of October 1944 were the regular routine of a Station Hospital. Battle casualties from the Palau Islands Campaign starting coming in and on 6 October, Major General Frederick Gilbreath, Commanding Officer, South Pacific Base Command (SPBC) and members of his staff, visited the Hospital to present Purple Heart Medals to those recent casualties. There were some changes in the overall organization of the South Pacific Area. On 15 June 1944, the South Pacific Area (SPA) was redesignated the South Pacific Base Command (SPBC) under the direct command of Admiral Chester W. Nimitz’ Headquarters. On 1 July 1944, the Central Pacific Base Command (CPBC), assumed responsibility for the logistical support from the USAFICPA; and on 1 August 1944, the United States Army Forces in the Central Pacific Area, became the United States Army Forces, Pacific Ocean Areas (USAFPOA), under Lieutenant General Robert C. Richardson, Jr.
On 15 October 1944, Brigadier General William I. Rose, Commanding General, New Caledonia Island Command, visited the Hospital making bedside presentation of Purple Heart Medals to evacuees from the Palau Islands. On 20 October, 25 American Red Cross girls arrived at the base from the United States and were temporarily attached to the Hospital for rations and quarters, awaiting assignment in New Caledonia and other bases in the South Pacific. Many changes in personnel were effected during October. Three (3) EM were returned to the ZI to fill the September rotation quota. Some Officers were transferred and others released from TD, while a few additional Nurses were assigned and joined the 27th Station Hospital, as per Paragraph 4, Special Order No. 277, Headquarters, South Pacific Base Command, dated 6 October 1944. P.S. Major Tyler J. Stroup still on DS with Headquarters, New Caledonia Island Command, together with Captain Herbert Weitzner also on DS with this Command. Captain John D. Shinberg, 1st Lieutenant Adam Kreps, and 1st Lieutenant Jay R. Fickes, still on DS with the 331st Station Hospital. Sixteen (16) Enlisted Men were on duty with other units. During November 1944, groups of Enlisted personnel were given 5-day passes for the purpose of visiting other places of the island. Recreational buses were provided by Headquarters, Island Command. This added much to the entertainment of the Enlisted Men. Groups of at least 4 or more were furnished a bus and a driver upon request for any organized recreation. A new Recreation building (40’ x 45’) was completed by 10 November. It was built on a point overlooking Nouméa harbor, offering a beautiful view and constant breezes. It was operated solely by the Enlisted personnel with 1 Officer selected as liaison between the Club and the CO.
After completing two years of continuous service and support in New Caledonia, the unit had hospitalized 20,128 patients and treated numerous outpatients in its various Clinics. List of Enlisted Men of the 27th Station Hospital who were entitled to wear a miniature bronze ”battle star” (on the Asiatic-Pacific Campaign ribbon) presented during an official award ceremony that took place in April 1944 (Guadalcanal 7 August 1942 > 21 February 1943; Northern Solomons 22 February 1943 > 21 Nov 44; Central Pacific 7 December 1941 > 6 December 1943). The very first battle casualties from the Philippines arrived on 22 November 1944; this was another occasion for Major General F. Gilbreath to visit the organization once more and make some bedside presentations of Purple Heart Medals to the evacuees. More casualties were eventually received from Leyte. On 23 November, 38 New Zealand women and 13 children, wives and children of American soldiers, sailors, and Marines, were attached to the Hospital awaiting transportation to the United States. Thanksgiving was properly celebrated with a skeleton crew in place, giving everyone possible a day off that ended with an ample traditional turkey dinner with all the trimmings. P.S. Major Tyler J. Stroup still on DS with Headquarters, New Caledonia Island Command. Major Louis J. Weinstein on a 30-day emergency leave to the ZI. 2d Lieutenant Robert E. Dupree, on DS with the 331st Station Hospital, APO 502. Eleven (11) Enlisted Men were on duty with other units. Early in December 1944 plans were made for the entertainment of both patients and personnel for the celebration of Christmas. Some promotions were confirmed. The Hospital functioned in a normal way with an average patient census far less than in December 1943. On Friday, 15 December 1944, at a meeting of all Officers, Nurses, and Noncommissioned Officers, the CO announced that he had been ordered to alert the unit to evacuate all patients either to duty or transfer them to another hospital, and pack and crate all equipment. The message was received with great enthusiasm. After 24 months of operations at the New Caledonia base and with the progress of the war in the Pacific region, all personnel were anxious for an assignment near the combat zone. Unfortunately the above orders disrupted the plans as arranged for Christmas. Nevertheless all personnel, except the cooks, were given a day off and packages were passed out to members of the Detachment by the Special Services Officer and the American Red Cross staff. Religious services were carried out as scheduled. An excellent dinner was served to close the festivities. On the evening of 27 December, the personnel, with the exception of guards (left to protect the various Supply Rooms), moved to the 5th Convalescent Hospital area for training and staging before transshipment to another base. All equipment except that actually in use had meanwhile been crated and was ready for the journey. By the end of December 1944 there were many changes in personnel, although most of them were temporary. People were placed on Detached Service, replacements came in from the 6th Replacement Depot, some were relieved from their assignment and returned to the organization, and one Officer was sent on a 30-day emergency leave in the United States. P.S. Major Tyler J. Stroup was on DS with the 9th Station Hospital, APO 709. 1st Lieutenant Adam Kreps still on DS with the 331st Station Hospital. Nineteen (19) Enlisted Men were on DS with the 42d Quartermaster Battalion, for duty as truck drivers, and another 30 EM were still on duty with other units. Captain Robert S. Hormell, MC was appointed Plans & Training Officer on 2 January 1945, and an intensive training program was begun. The primary objective of this program was to prepare the unit for efficient performance of duties in or near the combat zone. To reach this objective special emphasis was to be placed upon familiarization firing of authorized weapons (in general Medical Department personnel did not carry weapons), defense against chemical warfare, passive antiaircraft defense, cover, camouflage, and concealment, local security, first-aid and sanitation, and numerous other subjects directly associated with the care and treatment of patients in a combat zone. Through the cooperation and courtesy of the Commanding Officer, 147th Infantry, Officers from that unit were engaged as instructors throughout the training program to present tactical subjects. All problems were presented in a practical manner with lecturing minimized and demonstrations and class exercises stressed. The majority of the command fired a familiarization course with M-1 carbines at the Dumbéa Firing Range. Fifty (50) percent of the male personnel were authorized to be armed with M-1 .30 caliber carbines and field grade Officers were authorized .45 automatic pistols. On 15 January 1945, the CO, 27th Station Hospital, was placed in charge of the 5th Convalescent Hospital Staging Area and received orders to open a 500-bed Convalescent Hospital using the unit’s personnel to care for the overflow of patients from the General Hospital at that area, and to maintain the Staging Area. The training was suspended, necessary operating supplies and equipment were uncrated and all Departments prepared to function. The 27th assumed operation of the facilities in the area and Wards and Mess Halls were opened in anticipation of incoming patients. The Administrative Section moved to the Headquarters building formerly used by the 5th Convalescent Hospital. On 17 January, 92 patients were admitted by transfer from the 8th General Hospital and on 10-20 January a total of 80 more were received evacuated from the 8th and the 29th General Hospitals. The Hospital Plant was prepared for proper care and treatment of these patients and functioned accordingly. New organization of the Medical Service in the Central Pacific Base Command (CPBC). The latter was responsible for all logistical support of the US Army Forces in that particular area. On 20 January 1945, shipping number 55210 was received and the next day warning orders came in for the command. Patient strength at this time was 173, but the Hospital continued to function. Final orders, New Caledonia Island Command were received on 22 January 1945 relieving the Commanding Officer of the unit of command of the 5th Convalescent Hospital Staging Area. Preparations were now made to close the hospital plant by transferring the patients back to the 8th and 29th General Hospitals in New Caledonia, which was accomplished by 24 January. The patients Mess Halls were closed and the Hospital proper dismantled. The training program resumed and work began on marking all boxes of supplies and equipment with the relevant shipping number. During this period, approximately 80% of the personnel were participating in the training while the remainder were busy crating and marking supplies and equipment. Special arrangements were made to return all personnel from other duties so that all might be present for training and immunization. Part of the personnel were already immunized against yellow fever and smallpox during the month. All men participating in the training program went on an overnight bivouac in an area near the Dumbéa River. Instructors instigated mock air raids and gas attacks and simulated combat conditions. Individual slit trenches were dug, a perimeter defense established, principles of camouflage practiced, signs and countersigns used, and no smoking, no talking, and no moving were enforced during the night. Many questions concerning living conditions in a foxhole or under live combat conditions were settled the next morning. Effective 1 March 1945, the 27th Station Hospital was relieved from assignment to the South Pacific Base Command and assigned to Tenth United States Army, per Paragraph 4, General Order No. 25, Headquarters, United States Armey Forces Pacific Ocean Area, APO 958 (USAFPOA). Then on 12 March 1945, the 27th Station was further assigned to Army Garrison Forces, APO 331, as per Paragraph 2, General Order No. 38, Headquarters, Tenth US Army, effective 1 March 1945. Orders would now come from Colonel Frederick B. Westervelt, MC, Surgeon, Tenth US Army. During March, much activity was shown by all staff and personnel of the command in getting prepared for movement to a new Theater of Operations. It was noted that since the 27th was alerted for movement morale of the organization was at a high peak and cooperation was of the best. Packing, crating, and drawing of both organizational supplies and individual equipment was carried on with success. At 0100, 27 March 1945, the first detail began work at the 27th Station Hospital warehouse located on Anse Vata Beach, New Caledonia. The task consisted of loading supplies and equipment on 2½-ton trucks for transportation to the docks to be loaded aboard ship. Other details were formed throughout the day to continue work in order to complete the final details of packing and crating. Everything was completed by 12 April 1945 and the same day personnel was moved to the docks boarding the USS “Sea Flyer” at exactly 1415 hours. The USS “Sea Flyer”, sailed from Nouméa harbor, New Caledonia, at 1715 hours, 12 April 1945, making stops at Guadalcanal, Eniwetok, and Saipan. Personnel of the unit were assigned enroute as guards and mess personnel. Although the convoy underwent several enemy air raids and submarine alerts, no action resulted. Four (4) days away from the objective, booklets were distributed to all staff and personnel as a guide to a place yet unknown: Okinawa, Ryukyu Islands. Photograph showing an x-ray procedure at the 69th Field Hospital, Shimobaru, Okinawa. The transport dropped anchor at Ie Shima (where the famed journalist Ernie T. Pyle was killed 18 April 1945 –ed), 6 May 1945 remaining at anchor for two days. During this period many air raids and attacks by kamikaze planes (enemy suicide aircraft) were seen but fortunately no direct action seemed to be directed against the transport. The ship moved into an Okinawan harbor on 8 May and the personnel debarked at 2330 hours, 9 May 1945 without problems (the organization was the first Station Hospital to land on Okinawa, and 3 more arrived late May –ed). They were bivouacked at the planned assembly area until 13 May. Medical Officers, Nurses, and Enlisted Medical and Surgical Technicians were grouped and placed on TD with other US Army Hospitals while the remainder were moved to a semi-permanent area near Koza (it must be stated that the unit was not part of the TF and assault forces landing on Okinawa but arrived in a separate convoy of 4 troop transports on D+36, escorted by the Destroyers USS Richard S. Bull, DE-402, and the USS Eisele, EDE-34 –ed). The organization’s primary mission was to operate a 500-bed Station Hospital and service the US garrison forces stationed on Okinawa. Important to note is that for the first months of operation, the hospitals on the island lacked female Nurses, as they were not allowed to accompany the invasion forces being excluded because of the combat hazards. The very first Nurses assigned for service on Okinawa landed on 3 May 1945. Immediately following debarkation, Major General Earl Maxwell, MC, Surgeon, Island Command, APO 331, visited the 27th and gave the Hospital full support in arranging priorities for unloading organizational equipment and supplies and moving it to the selected area. Considering the haste necessary and because of the bad weather on the island the equipment was unloaded and moved with negligible loss and damage. Although initially destined to provide care for the Island Garrison Forces only, the need for hospitals was so great that after setting up a limited number of ward tents, the Hospital almost immediately received a considerable number of battle casualties in addition to providing medical care for garrison patients. The temporary hospital site was secured upon arrival of the unit for possible enemy infiltration. Six (6) enemy soldiers were killed and 7 other Japanese were captured by armed work details of the organization. Although the Hospital was located near two harbors, it only sustained a single casualty as a result of enemy action. One of the Nurses was wounded by a shell fragment while on duty with a Field Hospital. Duty was rough because of the heavy rains, the mud, and the occasional friendly fire. On 21 June 1945, a 5-inch shell from a ship hit the ward area of the 69th Field Hospital seriously wounding 3 members of the personnel and causing injuries to another 12 or 15. Following the end of the campaign, medical personnel worked further tending Japanese POWs and civilians as well as vaccinating and treating some of the GIs stationed on the Island, awaiting the planned invasion against Japan. From L to R: War Correspondent Ernie Pyle talking to infantrymen on Ie Shima; photo taken on 17 April 1945. Wooden sign put up by personnel of the 77th Infantry Division, to remember their buddy, Ernie Pyle, killed by the enemy on 18 April. Temporary tents are set up at the approved permanent site for the 9th Station Hospital on Okinawa. Official Asiatic-Pacific Campaign Medal instituted in 1942 and awarded to all services and personnel who served in the Theater for at least 30 days. The authors are still looking for additional data covering 1945 late war operations conducted by the 27th Station Hospital on Okinawa, Ryukyu Islands, and the unit’s return to the continental United States. A complete personnel roster would also be most welcome. Thank you. This page was printed from the WW2 US Medical Research Centre on 26th April 2019 at 02:45.